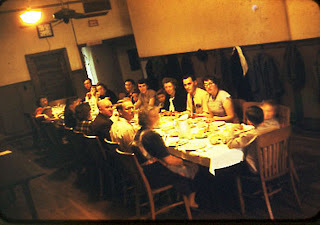 Seated around the table, clockwise from the front corner of the table: Myrtle Greer, Jimmy Greer, James T. Greer (branch president), Mary Jane Greer, unidentified adult, unidentified child, John Resch, Rosalee Resch. Continuing on the other side of the table: Fred Woolcott, Mike Woolcott, Eleanore Woolcott, Don Tatton, [son] Tatton, Betty Tatton, [son] Tatton, Iris Dombrow, Ray Dombrow, Louise Greer Erekson, Tommy Erekson, boy with back to camera (probably Jimmy Resch). Bob Erekson took the picture. Sunday School at 10:00 and Sacrament meeting at 6:30 meant that friends could come over to play all afternoon. Later when the popular television show Disneyland began airing at 6 p.m., it was a weekly trial of our faith to leave it and head back to church. On the first Sunday of each month the schedule varied because of Fast Sunday. On this day people were supposed to abstain from food and drink for 24 hours, but most people just skipped breakfast. Sunday School was shortened and fast and testimony meeting began immediately afterwards. After the song and prayer and the partaking of the sacrament, the time was turned over to the congregation for anyone and everyone to “bear their testimony” or stand and express thanks for blessings that month and witness that they knew the Church was true. Young and old stood up one after another. This kind of sharing built community more than anything else, unless it was the dinner that followed each month. Throughout old Brother August Kramer’s lengthy testimony in broken English, the smells of a church dinner wafted in from the kitchen in the back. Casseroles and pies warmed in the ovens during the meeting so that as soon as the last amen sounded, the brethren could set up the tables and move the chairs over for the Fast Day feast. Grandma Greer had baked mountains of rolls; Aunt Rosalie had brought her famous noodle-beef hot dish. Summers meant big platters of Grandpa Greer’s steaming sweet corn and plates of garden-fresh sliced tomatoes, green peppers, and cucumbers. Fast Sundays also meant no evening meeting. We could stay home and watch Disneyland at our leisure, and be like the rest of the world for one hour.